TTG’s exclusive look at Equality in Tourism’s 2018 report reveals travel has fallen behind government targets for top-level female representation. James Chapple reports. The travel, tourism and hospitality industry is broadly more gender equal than it was five years ago – but only just, a new report into the standing of women in travel has found. The latest Equality in Tourism report, entitled Sun, Sand and Ceilings, concludes insufficient progress has been made over the past five years, with the industry “seriously lagging behind” other sectors, not to mention national and international targets. 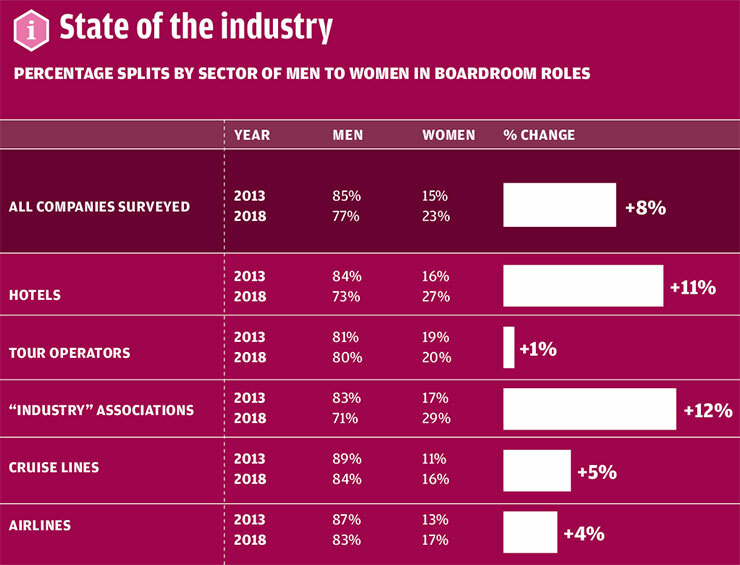 In 2013, a survey of 78 UK organisations across five sectors – hotels, tour operators, professional associations, cruise lines and airlines – found the overall representation of women on company boards was just 15%. This is despite women, worldwide, representing considerably more than half the labour force in travel and tourism. Board representation, the new report says, is a “key indicator” for companies’ strategic commitment to gender equality in key decision-making and leadership roles. The 2013 report proposed a minimum of 25% representation by 2015, in line with the government’s recommendation to FTSE 100 companies as set out in the 2011 Davies Review. The FTSE 100 achieved this goal; three years later, travel and tourism has not. Equality in Tourism’s 2018 report – this time based on publicly available data from 53 of those 78 organisations surveyed in 2013 – finds female representation at board level across travel and tourism in the UK has increased to just 23%. This is not only below the 25% target set for 2015, but also some considerable distance short of various subsequent government recommendations. Three years ago, the government challenged the UK’s 350 largest companies to achieve 33% female board representation by 2020. The EU set a 40% target. By whichever measure, if 2018, or realistically now 2019, is to be the year travel grasps the nettle, the curve is steep. The industry starts three years behind and some 10% short of where its counterparts in other industries are expected to be by 2020. “As the employer of a majority female workforce, the tourism and hospitality industry should exceed expectations and take the lead to aim for full equality between men and women, not only on company boards, but also in senior and executive positions,” the report states. What remains clear is travel and tourism is not only still a male-led industry in which women prop up the majority of its major functions, it is an industry struggling – rather than failing – to embark on the change expected of it. This is not lost on Dr Angela Kalisch, chair of Equality in Tourism and one of the authors of the report. She has been leading efforts to encourage collaboration between the industry and groups such as Equality in Tourism. However, despite some progress, she tells TTG the group has encountered resistance. “It’s difficult to pinpoint why,” she says, citing tentatively, as does the report, the impact of the culture of mergers and acquisitions within travel, which has given rise to “change, turnover and flux”. Another area she highlights, while making it abundantly clear it should not be considered an excuse, is the size of major corporations. Of the five UK-based sectors surveyed, tour operators (+1%), airlines (+4%) and cruise lines (+5%) achieved the lowest rates of gender equality growth at board level. They also took the bottom three spots in terms of boardroom equality: 20%, 17% and 16% respectively (women to men). Kalisch cites the hotel sector as perhaps having made the greatest visible advances, in particular Radisson. Its 2016 Responsible Business Report championed diversity and inclusion while prioritising talent – independent of gender. However, again, this has been tempered by M&A. “The hotel sector is in the process of making big changes,” says Kalisch. The report praises the efforts of some smaller, more nimble operators such as Intrepid Travel, which has already achieved parity across its leadership team. It has also enacted many of Equality in Tourism’s key drivers of change – mentoring procedures, unconscious bias training and flexible working, as well as setting targets for how it plans to shape its leadership team long-term. Kalisch believes part of the problem is how the industry is structured in terms of gender, being bottom-heavy in terms of women. “It is very diverse,” says Kalisch. “But most women are in lower-paid, part-time or lower-skilled roles. It’s difficult to progress from that base. While praising the government for ordering April’s gender pay review, Kalisch concedes there are arguments for and against legislative measures to drive gender equality, stressing change is usually more effective when it is organic but acknowledging this change may, otherwise, never come to fruition. There are successful examples. Iceland has introduced legislation requiring companies with more than 25 employees to prove they pay equally. Norway, meanwhile, has since 2013 mandated at least 40% representation of each gender on the boards of public limited companies. It calls for bold strategies, legislation and regulation, rigorously enforced and implemented, and regularly monitored with the results publicised transparently. Key for Kalisch, though, is positive, affirmative and, crucially, swift action on gender equality. She believes all companies should first undertake a gender audit to simply establish how many women they have, what jobs they are doing, what skills they have and what avenues aren’t currently open to them. Secondly, with female employees largely concentrated in lower-skilled, less well-paid roles, a common issue, says Kalisch, is a lack of strong female mentors and role models, necessitating both the drive for greater gender equality at the highest echelons of companies, but also high-level corporate leadership on gender equality. While she praises the government for its efforts to encourage and promote gender equality matters, such as mandatory gender pay gap reporting, she believes more can be done to measure progress and, importantly, ensure it is reported publicly. Training is another important consideration, particularly around any unconscious bias that exists in a group. “It’s not always comfortable,” says Kalisch, reiterating the report’s message this must start from “fertile ground”, i.e. executive level. Finally, companies must draft and adopt strategies for change. They must audit and analyse, set targets and embrace transparency. They must “talk, collaborate and, vitally, learn”, the report advises. Next steps for Equality in Tourism include a round-table discussion featuring key figures from all five travel and tourism sectors. “We have to start a debate,” Kalisch says. “It’s critical people from different parts of the industry speak to each other, share with each other and learn from each other.